Educational games aim to increase knowledge or traing skills that are useful outside the gaming world. GCompris is a free game. This means that the source code is available to be studied, modified, and distributed. Most projects look for help with testing, documentation, graphics, etc., as well. Below you can find a list of categories with some of the activities available in that category. 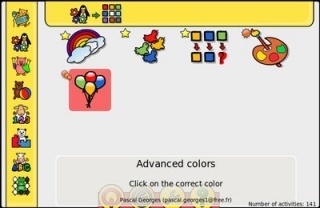 For more specific use, it can be easlily configured to be run in a kiosk mode, so small children cannot accidentally switch to other programs. On the technical level, GCompris is designed in a way which makes it easy to develop additional activities. garith is a free game. This means that the source code is available to be studied, modified, and distributed. Most projects look for help with testing, documentation, graphics, etc., as well. 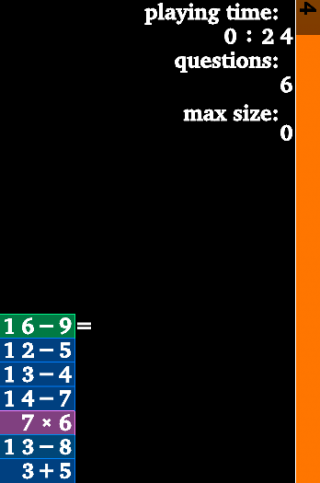 garith is a game similar in spirit to BSD's "arithmetic" or TuxMath. The game asks you to perform a simple arithmetic operation within a certain time-frame. garith though is geared to improve your skills by stressing the operations you get more frequently wrong or that take longer to answer. The statistics are saved/restored across games, so that each game is tuned for your current arithmetic abilities. It is written by Yuri D'Elia in the C++ programming language using the FreeGLUT library. 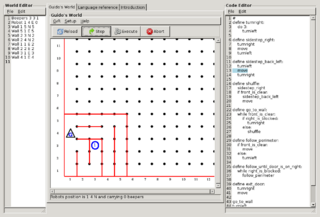 GvRng 3.1 running a complex program on a complex map. Guido van Robot (GvR) is a free game. This means that the source code is available to be studied, modified, and distributed. Most projects look for help with testing, documentation, graphics, etc., as well. Guido van Robot is a programming language, an IDE and a tutorial designed as an introduction to the fundamentals of (Python) programming for beginners. It is licensed under the GNU GPL. The latest release is 4.1 (2009-01-09). The program includes a tutorial, whose latest release is 0.4. A program, written or loaded by the user in a Python-like language that includes 5 instructions, 18 tests, conditional branching, iteration and new instruction definition. 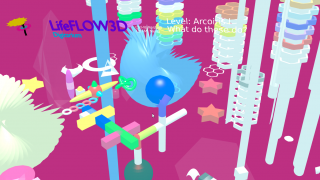 LifeFLOW3D 2018-03-29 Educational LifeFLOW3D Digitarium lets you play with moving software creatures, as they explore their lush environments. LifeFLOW3D lets you play with moving software creatures, as they explore their lush environments. LifeFLOW3D is a free game. This means that the source code is available to be studied, modified, and distributed. Most projects look for help with testing, documentation, graphics, etc., as well. In LifeFLOW3D, you interact with various geometric systems that respond to your avatar. Kids learn about space and time, and get a feeling for exciting ways to play with colors and shapes. It is released under the GPL 3.0 license. PrimeShooter is a free game. This means that the source code is available to be studied, modified, and distributed. Most projects look for help with testing, documentation, graphics, etc., as well. 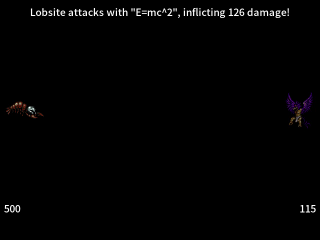 PrimeShooter is an abstract browser based shooter game licensed under the GPLv2. 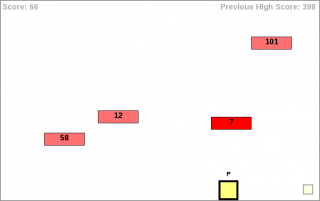 The player must shoot falling numbers with their divisors and scores points for clearing prime numbers. q is a free game. This means that the source code is available to be studied, modified, and distributed. Most projects look for help with testing, documentation, graphics, etc., as well. q (also known as quizbot) is a simple IRC quizbot by plaimi. It derives questions from a pool, gives out hints, and awards users who answer the questions correctly. All source code is available online, and patches are welcome. The bot is running an "official" instance in the registered channel #quiznode on irc.freenode.net. Ri-li is a free game. This means that the source code is available to be studied, modified, and distributed. Most projects look for help with testing, documentation, graphics, etc., as well. 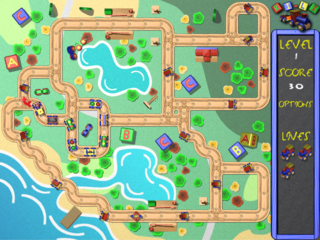 Ri-li is an arcade game in which you drive a toy wood train engine across many levels. It is written by Dominique Roux-Serret. The latest version of the game is 2.0.1 on November 1st, 2007. It is written in the C++ programming language, using the SDL library. Its UI has 19 languages to choose from: Arabic, Breton, Chinese, Dutch, English, Esperanto, French, German, Hungarian, Italian, Japanese, Korean, Polish, Portuguese, Russian, Slovak, Spanish, Swedish, Turkish. Scrabble3D is a free game. This means that the source code is available to be studied, modified, and distributed. Most projects look for help with testing, documentation, graphics, etc., as well. 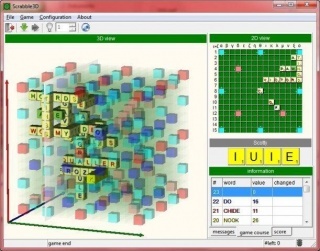 Scrabble3D is computer version of the popular word puzzle board game. In addition to a 3D board, it supports the classic Scrabble and Superscrabble rules. Scrabble games can be played online against other players or locally against the computer. Tangomon is a free game. This means that the source code is available to be studied, modified, and distributed. Most projects look for help with testing, documentation, graphics, etc., as well. Tangomon is an educational monster-battling game, similar in concept to the popular Pokemon series but with an educational twist. The player starts with one "Tangomon" and three "Tangojis". Tangomon are monsters which exist in the world of the game. Tangojis are used to command the player's Tangomon to attack and defend; they are terms the player wants to learn, e.g. vocabulary words. When the player feels they have learned a given Tangoji sufficiently, it can be converted into a "Tangokan", which can be used to capture defeated enemy Tangomon. The game does not have an ending. Instead, the goal of the game is to collect all Tangomon, and the player can then reset the game state and start over again from the beginning while keeping the same set of Tangojis and Tangokans. 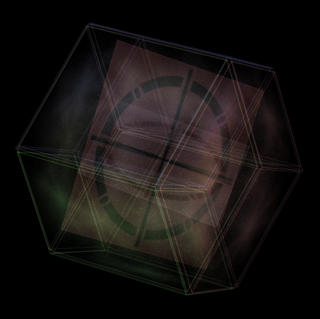 A capture of the rotating tesseract at the program’s default settings. Tesseract Trainer is a free game. This means that the source code is available to be studied, modified, and distributed. Most projects look for help with testing, documentation, graphics, etc., as well. Tesseract Trainer is a demo that displays a tesseract (the four-dimensional hypercube, analogue of the three-dimensional cube) as a 2D image, or viewable as a 3D image using a method similar to that one for viewing stereograms. Although it contains shareware functionality (“Unregistered” is displayed in the corner, and a registration code ($8) request appears after some time of continuous running), the source code is available under a GPLv2-compatible license (apparently public domain except for the reused parts like GLUT). It is written in C++, and the latest version is 0.1.4, released on 2005-06-09. It used GLUT, SDL, among other libraries. The author released all the copyright rights for the game’s documentation. 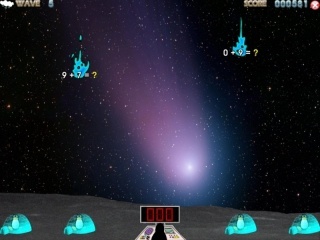 The gameplay is to shoot mathematical expressions with answers. ↑ q source code on github.